It has become my tradition on Christmas Eve to stay up way too late, attempting to compose an article or create some work of art to post here in celebration of the holy Nativity of our Savior. More often than not, nothing even remotely worthy emerges from this effort and I am reminded that I could have more fruitfully spent this time in prayer. This Christmas morning it is evident to me that there is but one question before me: will I be humble enough to receive Him? Our celebrations of the birth of Christ are both a foretaste and a fulfillment. God has fulfilled our every desire and need by coming among us, allowing us to not only hear His holy Word, but to see Him and touch Him in the person of Jesus. Yet so unready are we in our brokenness to receive Him that we can only know this feast as a foretaste of what we hope for – the fullness of life, free from our weakness and sin. So often we fall into the corruption of Christmas, allowing the secular holiday to take precedence over the divine Gift that supersedes any other gift. Or we become so preoccupied with how we will share the Word that we do not allow ourselves become still, to be humble and open, in order to truly allow Him to be born in us. Will I be humble enough to receive Him? Not just to receive Him in Eucharist, in Christmas joy, but in every moment and every aspect of my life? Will I be open enough to receive Him in the rich and the poor, in the friend, the foreigner, the foe? Will my heart being loving enough to recognize Him in the tyrants, the abusers, the sinners of this world – as well as in His saints? Of myself, I am not that humble, that open or that loving. And this is why I need him. Why we all need HIm. Today the seed of His love is planted within us again. May we cultivate it, may He send us the rain and the sun we need for it to grow. May His love and truth flower within us. This entry was posted in Uncategorized on December 25, 2017 by mary. However, this time around, I think I see what the obstacle is. I have been preoccupied by beauty. Not that beauty has never caught my attention before. But recently I have been absorbed in the visual arts more intensely than I think I have been at any other point in my life. I see beauty and I want to draw or paint it. I want to try every medium I can – all at once, of course. While this is not possible, I have found a wonderful online resource that could keep me busy for years, developing my skills with tutorials. This situation presents something of a dilemma because I am simply not all that talented. And what little bit of talent God entrusted to me has not been trained or disciplined at all well. Hence, I see the beauty and can imagine just how the work should be done. However, when the brush actually hits the canvas, everything goes awry. What had seemed so simple to my mind’s eye becomes all tangled in the execution. When I see that something is off (e.g. form, color, shading), naturally I set about trying to correct it. And it becomes like an obsession. While I have always tended toward perfectionism, this feels like a holy quest. Beauty, after all, is one of God’s names. I must not tarnish it. What I produce will never match what He has created. I will not even come close. However, the call to art is much like the call to parenthood. It is an invitation to be a co-creator with God. We were made to share in His life. And that includes creating – even if on a very limited basis in this lifetime. I do not know why this thought came to me but I must say that I questioned it. Who am I, poor artist that I am, to draw the holy Mother of God? While I did not consider creating an icon, I know enough about what that requires to be assured that I am unworthy. I so I said a prayer. I asked the Virgin Mother whether it was all right. I did not ask for a sign but just suggested that she lead me to lose interest in the idea if I ought not pursue it. A bit later that evening, I settled in to read the Scripture for the day. The Catholic bishops have a website where one can read or listen to these readings. They also provide very short video reflections for each day, based on the feast or the Scripture. I used to watch those videos quite often but I hadn’t in a long time. However, on this particular evening, I was tired and my eyes were too tired to read much. I wanted some help in reflecting on what I had just read. The reflection was offered by a woman and she talked some about Thanksgiving. I do not recall the details of what she said but something else jumped out at me immediately. She was standing in front of a picture of Our Lady of Guadalupe. This Friday was not a feast of Mary nor were the woman’s remarks related to the image. That just happened to be where she was standing when her talk was being taped. I do not know. But I could not help but feel that this was a sign. Not the kind of sign where the heavens open up and visions are seen. Just an awareness that something (someone) moved me to do something so I would see what was already there. As a result of this experience, I prayed and reflected – and watched a few tutorials on working with colored pencils. Interestingly, I felt drawn to use colored pencil even though I had never made a serious attempt with this medium before. Also interesting is that for a few months I had been feeling oddly drawn to purchase some high quality colored pencils. I kept resisting, reminding myself that I really didn’t need any more art supplies. Finally, I had broken down – the price was so incredibly good that I caved in to the yearning. And, until this moment, I felt bad for having done so. Why did I spend this money on something so unnecessary? So that Saturday and Sunday, while busy with other things, I began making preliminary sketches. I wasn’t sure when I would have time to really get into the work but I hoped that somehow it could be finished before her feast (December 12). Monday morning came around and my first patient of the day cancelled. Then I got a call from staff that our office had been badly flooded over the holiday weekend, a hot water heater in the office above ours having given way. I had to cancel all of my appointments and all of my work was caught up. I had the entire day and evening free. So I began to draw. I worked more slowly and carefully than my undisciplined self usually abides. I listened to sacred music as I drew, including an album of arias to the Mother of God. I prayed on and off as I worked, knowing without a doubt that I was not a good enough artist to do justice to my subject. As it got late, I could see a mistake in what I had done that seemed to ruin the piece. I tried some things to fix it but was exhausted. Nothing seemed to work. Could I have just spent an entire day on a work of art that was now only worthy of the trash? Once again, I knew that I needed to pray and trust. Mistakes in art are like mistakes in the rest of life – humbling. And God was at work to draw me more deeply into humility. I was reminded that this drawing was not for my glory nor was it born out of any achievement of mine. If it was meant to be, a solution would be given. I went to bed, knowing that I would be returning to work the next day. As soon as I got out of bed, I went to my drawing area and began a renewed effort to correct the mistake. I could only spend a few minutes but I could see that it was going to work. That evening – and a good many evenings after that, I returned to the heavenly Lady and my colored pencils. I found that I had grown close to her. I had begun to see with the eyes of my heart how very beautiful she was – with her dark Native features and fully pregnant, adorned like a queen. As the drawing reached fruition, I found myself listening for the words to describe her. And they came. Simple words to bear witness to her beauty – a beauty made manifest especially to small and faithful souls who have neither worldly knowledge nor material wealth. in the truth she carries. she bears beneath her heart. 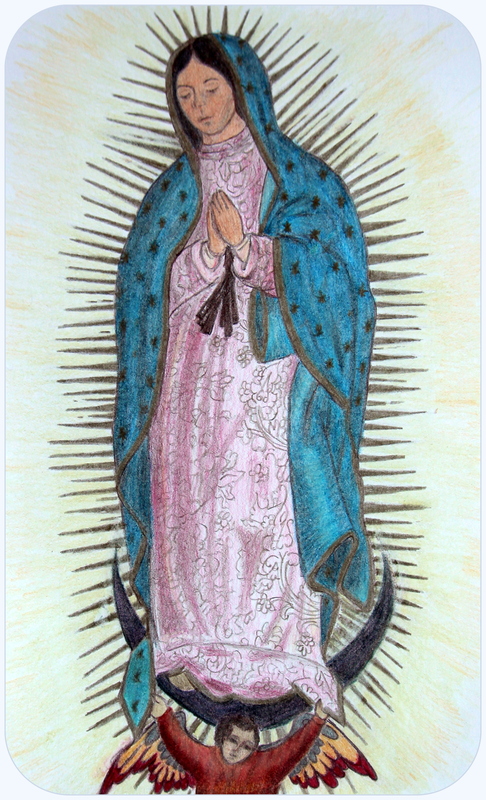 Please note that the portrayal I drew of the Virgin was based on the image discovered on the tilma of Juan Diego on December 12, 1531. The tilma with the image remains on display at the Basilica that was built in Mexico as the heavenly Lady requested. Thus, it is not a simply product of my imagination. The few differences, such as the detail in her face, came about as I was drawing with no clear plan on my part. I cannot explain them except that I felt called to attempt Native features as she was said to have had the appearance of an Aztec maiden and spoke in the indigenous language of Juan Diego. If you feel so called, you are welcome to download this image for any personal or nonprofit use. If you would like me to mail you a small laminated print, just e-mail me your name and address at marykbenton(at)outlook(dot)com (using the customary symbols in the address instead of words). + Let us pray for one another as we move together toward the feast of His holy Birth. This entry was posted in Uncategorized on December 17, 2017 by mary.